anticipating a quick ride up one floor to the lobby. I was surprised when the elevator kept going up and up. And I was even more befuddled when I looked out the lobby windows, and it appeared that we were still at the ground level. The clerk laughed. “Do not worry, Madame. We are a penthouse hotel.” He explained that the hotel occupies the top two floors of the Place Bonaventure office and retail complex in downtown Montreal. The public spaces and the 395 guest rooms overlook the rooftop, with landscaped gardens and a heated outdoor pool (above). If it weren’t for the surrounding city skyscrapers, you’d almost think that you were staying at a countryside estate. I recently spent 24 hours in Montreal, a far-too-short stopover on a cross-Canada rail trip (where my first two stops were at Jasper National Park and in the city of Winnipeg). For train travelers like me, the Hilton Montreal Bonaventure is conveniently located right across the street from Montreal Central Station; you can even follow an underground walkway between the station and the hotel, so you don’t have to venture outside. No matter how you’ve arrived in Montreal, it’s much easier to get around the city without a car, particularly if you can stay close to a Metro station. The Bonaventure is directly adjacent to the Bonaventure Metro stop. You’re within walking distance of the McGill University campus, as well as many downtown offices and attractions. Hotel self-parking is available for CAD$21/day, but you don’t have in and out privileges. If you really need your car while you’re in town, the valet parking option may be more convenient; although it will set you back CAD$29/day, you can come and go as you please. Once you’ve settled into the hotel, though, you may find it hard to leave. With the surrounding terraces and landscaped gardens, it feels like an oasis in the center of the city. The Bonaventure’s imposing 1960s-era facade recalls a Soviet architectural relic. Inside, though, the ambiance is coolly contemporary and surprisingly serene, given that the hotel was quite busy during my stay in the middle of a holiday weekend. 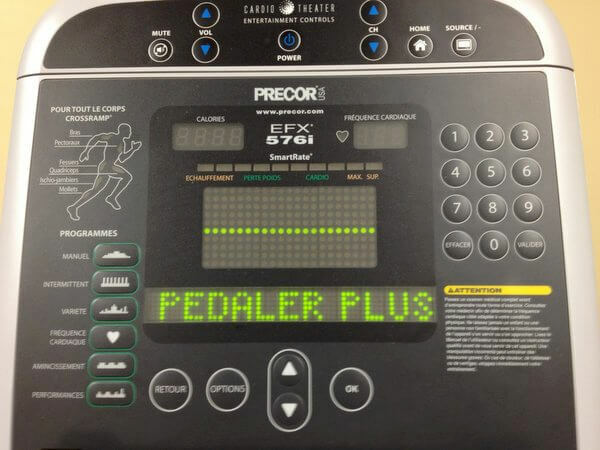 As at many Montreal properties, the Bonaventure’s first language is French — as I discovered when the eliptical machine in the large, well-equipped fitness center encouraged me to “Pedaler Plus!” But all the staff I encountered were bilingual and moved easily between English and French depending on their guests’ preference. The Bonaventure does a lot of meeting and convention business, and particularly on weekdays, the hotel caters to business travelers. The guest rooms have well-laid-out work desks with plenty of electrical outlets and complimentary Wi-fi. The concierge staff was extremely helpful with directions and suggestions. When I asked about how to buy an all-day Metro pass, the concierge not only explained how to use it but told me that he could sell me one, saving me a French-language negotiation in the Metro station. The Bonaventure has a bustling lobby bar as well as a full-service restaurant. Room service is available daily between 6:30am and 11:30pm. Despite the all-business ambiance, the hotel draws lots of families as well. I know my kids would have especially loved hanging out at the rooftop pool. While the guest rooms aren’t huge, they’d be comfortable for a family. Although many of the hotel’s features are Hilton-standard, the unusual penthouse location helps escape the chain-hotel feel. The guest hallways are laid out like a square, with some rooms looking out over the city and others facing the landscaped terraces. Inside, the color scheme is business-like browns and beiges, with crisp white linens offsetting the dark mahogany-hued furniture. I especially appreciated the bedside lamps with the easily accessible electrical outlets. I stayed in an “Executive Level” room, which offered access to the Executive lounge where I enjoyed an extensive continental breakfast (mmm, French pastries). I arrived too late for the evening cocktail hour available to Executive guests; the lounge also serves complimentary coffee and dessert in the evenings. The Executive lounge would be a handy spot for a brief business meeting, too, and has an outdoor terrace reserved for Executive guests. You do pay a premium for these Executive privileges, and if you prefer to take advantage of the city’s cafes, bakeries, eateries, and bars, you might not find the additional charges worth it. 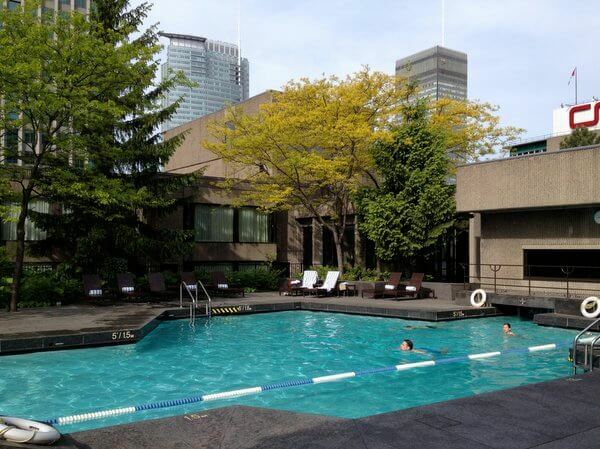 High-season double rooms rates at the Hilton Montreal Bonaventure are in the CAD$250-325 range. In winter or at other off-peak times, rates can drop as low as CAD$135, which is a great price for such a central location. You can also compare rates at Hotels.com, Priceline or Travelocity. 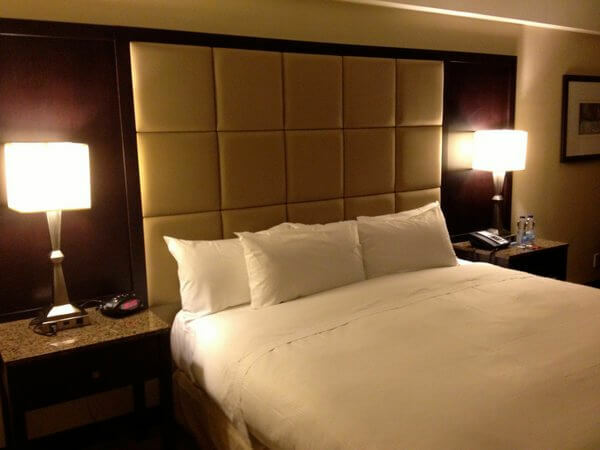 Why Stay at the Hilton Montreal Bonaventure? Sometimes, you want a hotel that puts you right in the center of the action. At other times, you want a lodging that lets you escape from your hectic daily life. 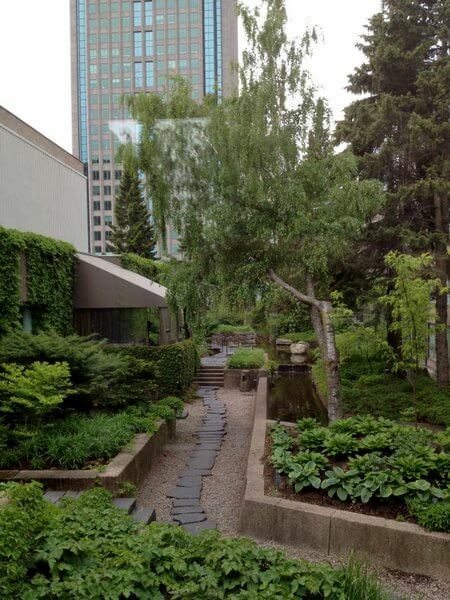 In Montreal, the Montreal Bonaventure rolls both of those options into one comfortable place to stay. Even if you don’t know what floor you’re on. Hotel review by Vancouver-based travel, food, and feature writer Carolyn B. Heller, author of the books, Moon Handbooks: Ontario and Living Abroad in Canada. Photos © Carolyn B. Heller. I paid a discounted media rate for my stay at the Hilton Montreal Bonaventure, arranged in partnership with Tourism Montreal.